The PORCELANOSA Grupo, through the firm, Gamadecor, presents three new bathroom furniture series at Cersaie 2017. The new collections, namely Brick, Magma and Mertens stand out because their aesthetic differences, without losing the firm’s essence, and taking as a common denominator the light and the natural environment as inspiration. 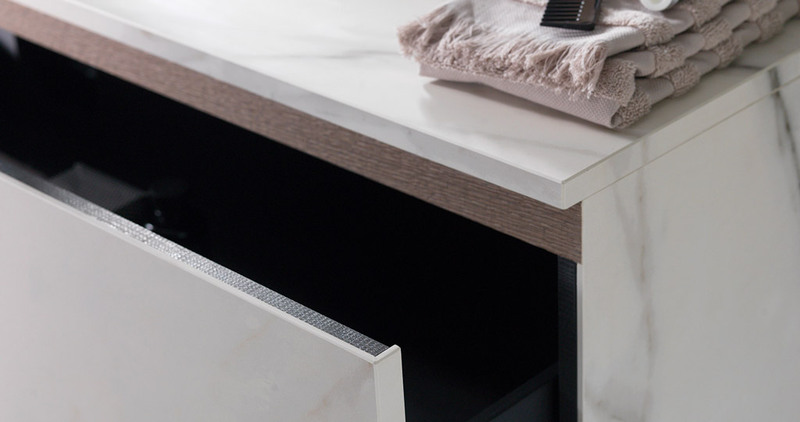 In this sense, the craftsmanship and refinement of their finishes are the hallmarks of this company specialised in the manufacturing of furniture for the kitchen and the bathroom, as well as manufacturing cabinets, dressing rooms, auxiliary furniture and lighting systems. 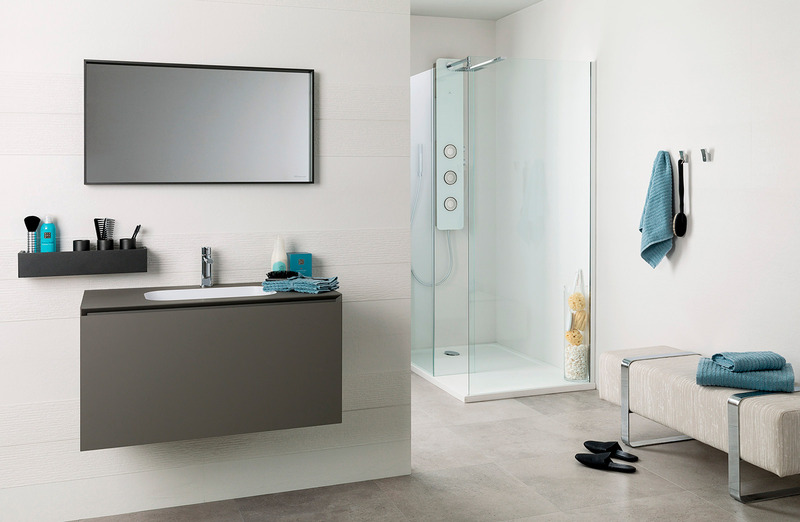 The Brick series is featured by using the XLight extra-slim ceramic material by Urbatek as a bathroom unit wall tile. 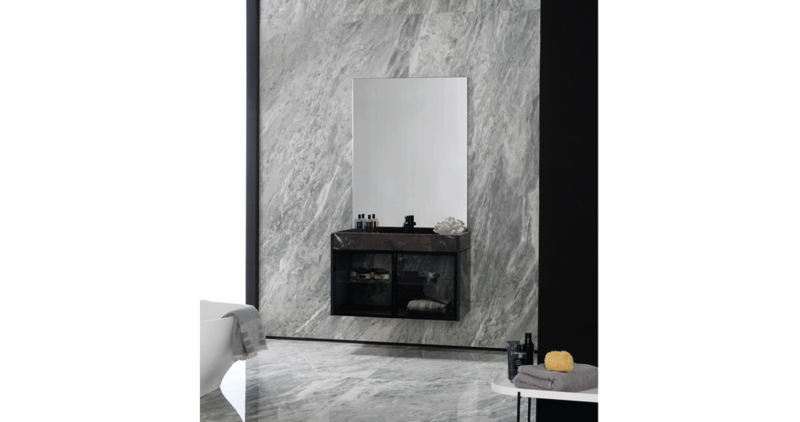 The result is furniture with a finish that emulates marble, providing the set with elegance and turning the bathroom into a timeless room. Likewise, the straight lines of the units show serenity and order in the space. This new collection is combined with a wooden shelf framed in aluminium with the Cien Sable colour. 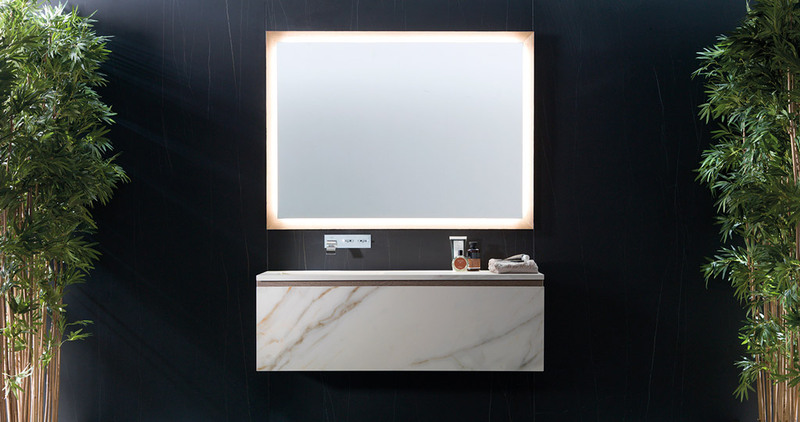 The contrast between the shelves, made in Roble Puro colour and the back, coated with the same Xlight White Nature ceramic finish as the bathroom furniture, offers a set that denotes exclusivity and sobriety. Brick is completed with a backlit mirror with led light, a clear reference to the leading-edge designs and innovations from the company that manages to create a space with character. In addition, the Magma series proposes a piece of furniture designed on a structure with an aluminium profile and coated with dark glass panels and doors. This type of composition has interior lighting that allows for what is stored in the unit to be seen. 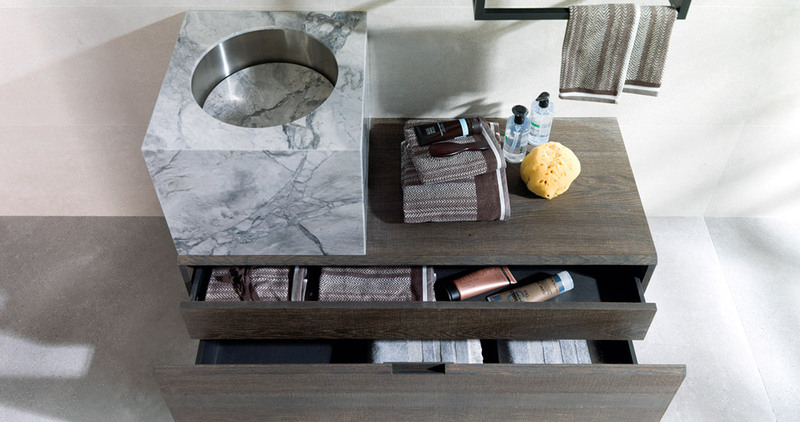 To finish this set, Gamadecor makes a commitment on a basin made of natural granite. These materials give a sophisticated aspect to the furniture, while evoking quietness in the room where they are located. 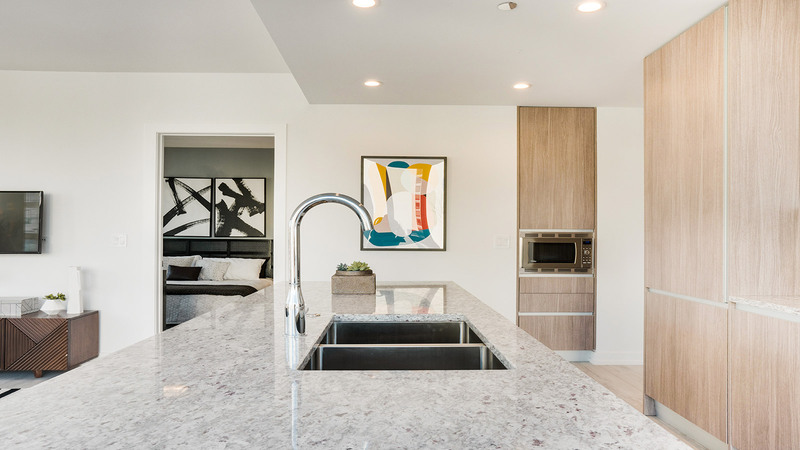 The innovations by the firm are complemented by the Mertens collection, which is featured by combining several basin and countertop options, as well as different finishes in which oak wood and wall tiles make all the difference. 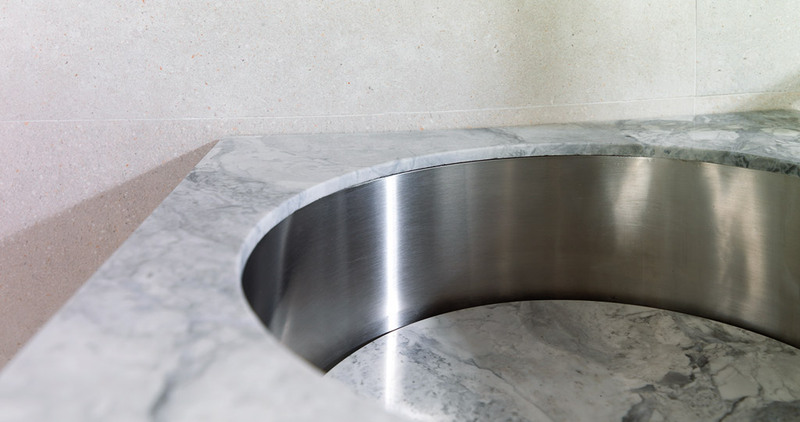 One of the options designed is a rectangular block, coated in natural granite, which shapes the basin. Another option consists of a wall-hung worktop and topped at the bottom by an oak bevelled frame that hides the wall brackets. This worktop is made of matt glass with anti-scratch and anti-fingerprint treatment, which is seen as an advantage when keeping the furniture intact regarding its daily use. Besides, the Mertens series incorporates a mirror with an internal section. It is worth mentioning that wooden furniture by Gamadecor are units made of rustified natural oak sheets. To achieve this finish, the production is subjected to an additional carving process that serves to mark the depth of the furniture vein with a greater intensity, creating a clear distinction in the sector. 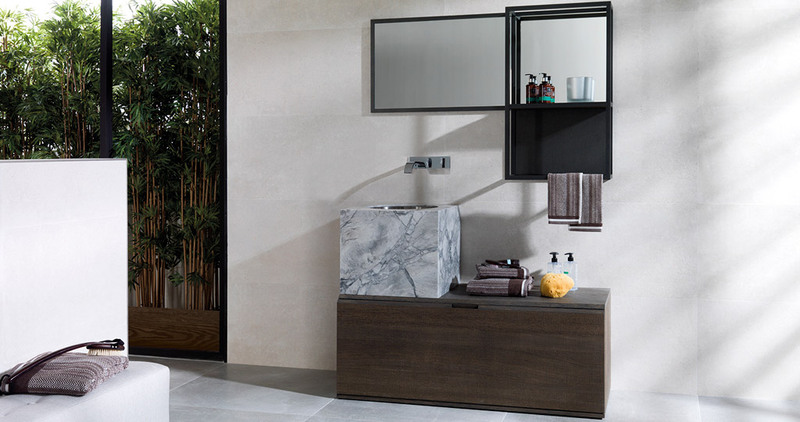 The Brick, Magma and Mertens series can be found in PORCELANOSA Grupo’s large space at Cersaie, located in Hall 26 Stand A296 B198 - A288 B293.